Sie sind hier: Home » Allgemein » Ozeanischer Wärmeinhalt im letzten Jahr stark zurückgegangen: Kurzfristeffekt oder Trendwende? Ozeanischer Wärmeinhalt im letzten Jahr stark zurückgegangen: Kurzfristeffekt oder Trendwende? Es ist ein weiterer Beleg für den Klimawandel: Die Ozeane heizen sich immer schneller auf. Neue Daten zeigen, wie sehr sich Forscher in der Vergangenheit geirrt haben. Der Untersuchung zufolge erwärmen sich die Ozeane rund 13 Prozent schneller als bisher gedacht. Hinzu kommt, dass sich der Prozess immer weiter beschleunigt. 1992 heizten sich die Ozeane bereits nahezu doppelt so schnell auf wie noch 1960, schreiben die Wissenschaftler im Fachblatt “Science Advances”. Erst seit 1990 erreiche die Erwärmung überhaupt Wassertiefen unter 700 Metern. The oceans may be storing 13 percent more heat than previously estimated, according to a new study co-authored by scientists at the National Center for Atmospheric Research (NCAR). The finding, published in the journal Science Advances, is based on a new analysis of how ocean temperatures have changed since 1960. The research team, led by Lijing Cheng of the Chinese Academy of Sciences, compared their results to estimates published in the Fifth Assessment Report of the Intergovernmental Panel on Climate Change in 2013. “In other words, the planet is warming quite a lot more than we thought,” said NCAR scientist Kevin Trenberth, a study co-author. The vast majority of excess heat trapped on Earth by greenhouse gas emissions — about 90 percent — is stored in the oceans, but measuring how the heat content of the oceans has changed over time has been a challenge due to sparse observations. Historically, the temperature of ocean waters was measured by a variety of ships, but this limited observations to areas where ships traveled. In more recent decades, measurements of ocean heat have increased, thanks to new observational techniques. In 2000, scientists began deploying a network of thousands of floats called Argo to profile conditions in the top layer of the ocean extending down 2,000 meters (6,562 feet). Argo achieved near global coverage in 2005, though some remote regions are still not sampled. To fill the large gaps in the historical ocean temperature record, the research team used a combination of statistical techniques and model output to determine how useful a single observation can be for inferring information about the surrounding area, as well as how the temperatures in different parts of the world’s oceans relate to one another. They found that, in most regions, a single ocean observation could provide valuable information about conditions as far as 2,000 kilometers (1,243 miles) away. 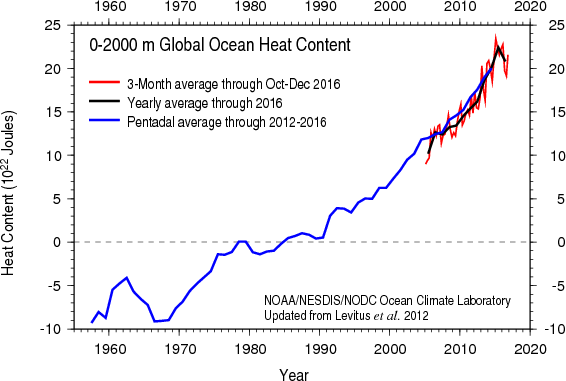 The results allowed the team to estimate the total warming between 1960 and 2005 to be 337 zettajoules (a measure of energy). They also found that changes were small until 1980, when the amount of heat stored in the oceans began to steadily increase. 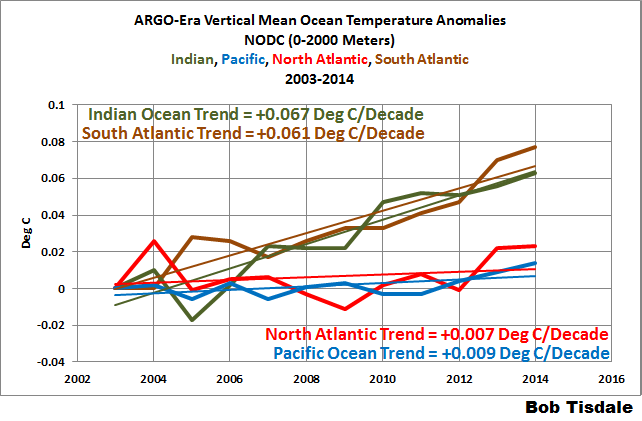 Since 1990, significant amounts of heat have begun to seep deeper into the ocean layers. NCAR scientist and co-author John Fasullo said the study also highlights the impact of improved observations and models, which are giving scientists important insights into what the world once looked like. “Science not only looks toward the future, but is also continually trying to make sense of the past,” he said. “This work is an example of how advances in technology have enabled an improved understanding of past changes in the ocean, where variability has always been a bit of an enigma due to its vastness and depth. The insights associated with this work change not only our understanding of past climate but also how future changes might unfold.” The other co-authors are Tim Boyer, of the National Oceanic and Atmospheric Administration; John Abraham, of the University of St. Thomas; and Jiang Zhu, of the Chinese Academy of Sciences. Abb. 1: Ozeanischer Wärmeinhalt (OHC) 2004-2017. Graphik: Climate4You. Abb. 2: Globaler Ozeanischer Wärmeinhalt (OHC) der letzten 60 Jahre. Graphik: NOAA. Abb. 3: Entwicklung des ozeanischen Wärmeinhalts, aufgeschlüsselt nach Ozeanen. Graphik: Bob Tisdale, WUWT. As the dominant reservoir of heat uptake in the climate system, the world’s oceans provide a critical measure of global climate change. Here, we infer deep-ocean warming in the context of global sea-level rise and Earth’s energy budget between January 2005 and December 2013. Direct measurements of ocean warming above 2,000 m depth explain about 32% of the observed annual rate of global mean sea-level rise. Over the entire water column, independent estimates of ocean warming yield a contribution of 0.77 ± 0.28 mm yr−1 in sea-level rise and agree with the upper-ocean estimate to within the estimated uncertainties. Accounting for additional possible systematic uncertainties, the deep ocean (below 2,000 m) contributes −0.13 ± 0.72 mm yr−1 to global sea-level rise and −0.08 ± 0.43 W m−2 to Earth’s energy balance. 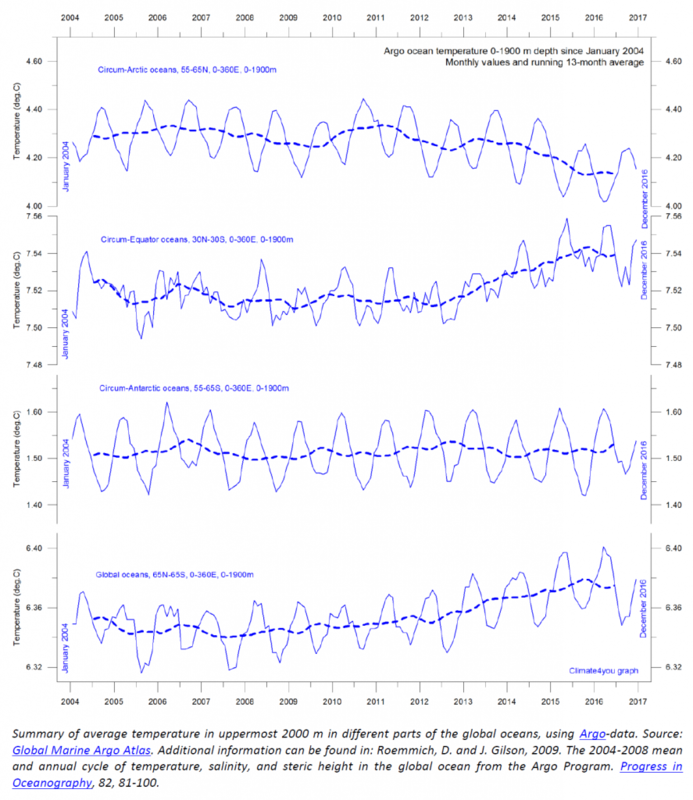 The net warming of the ocean implies an energy imbalance for the Earth of 0.64 ± 0.44 W m−2 from 2005 to 2013. Oder in anderen Worten: Der tiefe Ozean unterhalb von 2000 m hat sich von 2005-2013 abgekühlt! Passt nicht so gut zur Behauptung, der Ozean würde sich ingesamt schneller erwärmen als gedacht.